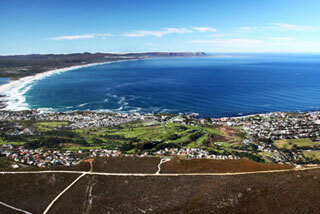 The area, generically referred to as Hemel-en-Aarde, lies nestled between two imposing mountain ranges. The Kleinriver mountains and Babilonstoring Mountains, with its highest peak rising to 642 metres. The property generally faces North West rising from the On Rus river at 180m to the highest vineyards at 275m above sea level. Midway up the slope, the cellar enjoys stunning views of the Atlantic ocean. Sumaridge Estate, experiences as does the rest of the Western Cape, a Mediterranean Climate with typically Winter rainfall and dry Summers. 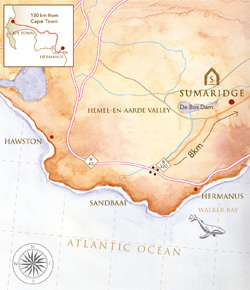 The Upper Hemel en Aarde Valley is one of four viticultural areas of the greater Walker Bay District which is well known for the influence of the cold maritime air blown off the Benguela ocaeanic current flowing off shore, up from Antarctica. The prevailing winds are, the Southeaster which blows up the coast towards the vineyard mostly in Summer and is funneled up the valley by the mountains and the Northwester, mostly in Winter, blowing in from the sea against the current, bringing precipitation. The air movement and the moisture off the ocean enhance the cooling effect, and our close proximity to the sea, equates to distinctly cool days and moderate nights relative to which ever season be it Summer or Winter. In the Cape, temperatures from December until March have the greatest impact on determining the cool climate style of our wines, as it is over these months the the grape mature and are harvested. During this time the average daily temperature is 25ºC, significantly cooler than most wine growing areas in South Africa. The average annual rainfall is about 750mm with about two thirds of that falling in during Autumn and Winter between March and August. The Cape is known to have some of the oldest soils in the world as evidenced by our tall very weathered mountain ranges. 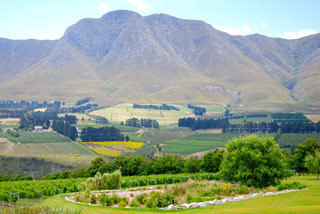 In the Upper Hemel en Aarde Valley the soil has marginal fertility and because of its age has many sedimentary inclusions brought down from the slopes over the eons. Predominantly of granitic origin our soils typically are coarse grained sands on the upper slopes changing to a more clay loam texture lower down but all with a free draining saprolytic clay (weatered mother rock) as a subsoil. Inclusions in the profile on the upper slopes are sedimentary ironstone and on gentle lower slopes fragmented quartz pebbles and orthoclase felspar typical of such decomposed granite. Situated -34° 22' 1.416" , 19° 15' 19.116 south Sumaridge Estate is located in the South African Wine of Origin ward of the Upper Hemel-en-Aarde Valley, which is located approximately 135 kilometers South East from Cape Town on the Cape South Coast. The splendor of the valley remained virtually unknown for thousands of years. When English became compulsory in the Cape, Dutch (Afrikaans) farmers founded schools and brought out teachers from Holland. Hermanus Pieters was brought to a farm in Caledon to teach the children. He was paid with sheep, and legend has it that during his holidays, he trekked over an ancient elephant trail through the Hemel-en-Aarde valley to a spring that provided excellent grazing and where he could also fish from the rocks. The spring, and the village that developed came to be known as Hermanuspietersfontein, although having died in 1837, he never lived to see the town that took his name. By the early 1900s, word of the excellent farming, fishing, outstanding beauty and “healing” air had spread. It even became fashionable for doctors in England to prescribe visits to Hermanus to take in “champagne air”. One of the first regular visitors to the town was Sir William Hoy, General Manager of the Railways. He ensured Hermanus would stay unspoiled by blocking attempts to extend the Bot River railway to the village. His legacy lives on in the Hermanus Station (now the tourist information office) that has never seen a train or sold a ticket! Since the early 20th Century, the fertile land in the valley has been a magnet to farmers and crops flourished. The pioneer in Hemel-en-Aarde's wine history was undoubtedly Tim Hamilton-Russell, whose quest to find the perfect cooler region to grow the best noble grapes in the world took him ten years to complete. Having found this steep-sided region east of Cape Town, he bought the undeveloped property in 1975, and with Peter Finlayson began to produce wines of worldclass excellence, paving the way for other producers in the valley. Back in 1975 the Estate now known as Sumaridge was comprised of four farms growing, predominantly apples, and it would be another 20 years before these farms would be integrated and laid to vine by George Sumaris, from whom the Estate takes its name.